WASHINGTON (Reuters) - The U.S. government reopened fully on Monday with about 800,000 federal workers returning after a 35-day shutdown triggered by President Trump's demand for a border wall as lawmakers geared up for talks to avoid another standoff in three weeks. 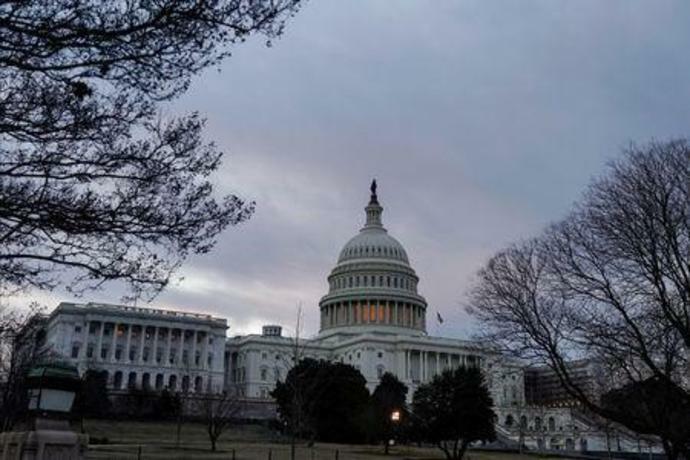 The longest shutdown in U.S. history ended on Friday when President Donald Trump and Congress agreed to temporary government funding - without money for his wall - as effects of the shutdown intensified across the country. Trump had demanded $5.7 billion toward building his long-promised wall along the U.S.-Mexico border, which he says is necessary to stop illegal immigration, human trafficking and drug smuggling. It remained to be seen how lawmakers address border security before the Feb. 15 deadline while avoiding another closure. A committee of lawmakers from both parties will try to negotiate a compromise on border security as Congress prepared to reconvene on Monday. "There will have to be compromise," U.S. Representative Dan Kildee, a member of the House Democratic leadership, told CNN in an interview on Monday. He urged fellow lawmakers to ignore Trump's wall rhetoric and "put our heads down and do our job." Trump has vowed to shut down the government again unless an acceptable border deal is reached and on Sunday expressed skepticism that such an agreement could be made. He also left open the possibility of declaring a national emergency to get money for the wall, an extraordinary move that Democrats and some Republicans have vowed to fight and that would likely face a court challenge. Trump, who had initially said Mexico would finance the wall, did not address the government reopening or shutdown talks in a series of tweets on Monday morning. Democrats, eager to capitalize on their political victory, oppose any money for a wall but say they back additional funding for security measures along the border, such as increased technology and more Border Patrol agents. Republicans, who controlled both the Senate and the House when the shutdown began Dec. 22, are wary of a repeat closure. Polls show the public mostly blamed Trump and his party for the standoff. Any agreement must win over House Speaker Nancy Pelosi and her fellow Democrats, who now control the House as well as enough Democrats to reach the 60-vote threshold for funding bills in the Republican-controlled Senate. Democratic Senator Maggie Hassan told CNN she was open to a deal with money for strategic border fencing but not Trump's wall. Federal workers are expected to get paid this week for the five weeks of missed paychecks. Federal contractors and businesses that relied on federal workers' business, however, face huge losses, although some lawmakers are pushing legislation to pay contractors back as well. House Democrats plan to offer legislation to increase civil servants' pay, Representative Don Beyer, whose Virginia district is home to many federal workers, tweeted on Monday. Some lawmakers are also examining ways to outlaw any future shutdowns, the New York Times reported over the weekend.